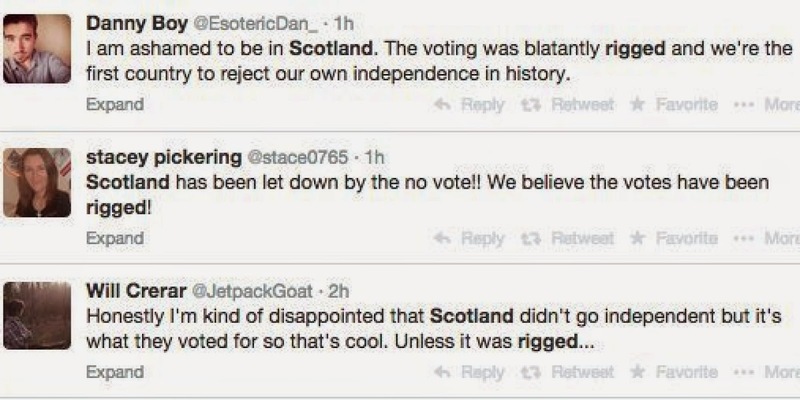 So Scotland the not so brave bottled it. Or, rather, they were robbed. Social media are awash with filmed evidence of officials marking ballot papers and stuffing “yes” votes into “no” piles to achieve the result the British establishment had predetermined. I was resigned to living just over the border from a latter-day Zimbabwe if the vote had gone the other way, but was surprised to find that I already was. But then this sort of conspiracy theory mainly appeals to those who also believe that alien abductions are commonplace, the Moon landings never happened, and Diana was murdered by British intelligence on the orders of the Duke of Edinburgh. There are echoes of the somewhat unhinged mourning for Diana in the groans and whines audible across the border. Rather pleasingly for those of us who associate “The 45” with the doomed, romantic Jacobite rebellion of 1745 that came to a bloody end at Culloden, this is the name adopted by those whose dream of independence simply refuses to die. Just some of the organisations The 45 intend to boycott. Good luck with that. Today’s question is: what now? And the answer looks like shaping up to be: let’s give the Scots pretty much everything they wanted in terms of control over their own affairs, while preserving their unfair advantage in public spending and allowing their MPs to continue to sit in Westminster and vote on purely English and Welsh matters. You don’t have to be a Tory or UKIP partisan to spot that this is grossly unfair. But how to resolve it? I know, let’s balkanise England into EU-approved regions and elected mayoralties, even though the people reject these ideas out of hand when they are put to them. Then we can say we are on a level playing field, with devolution for all. Or if you don’t fancy that, why not create a new English parliament somewhere like Sheffield, so we can say we are addressing the north-south divide as well as restoring the balance between England and Scotland? I’ll tell you why not. Because the last thing almost any of us want is yet more politicians operating more layers of government. 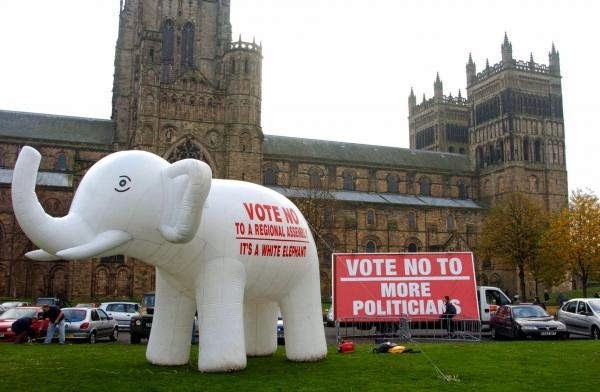 I live in conservative rural Northumberland and Conservative rural Cheshire. Both communities have far more in common with each other – and arguably with similarly rural Dorset, Angus, Montgomeryshire or Antrim – than north Northumberland has in common with post-industrial Gateshead or Teesside. Which is why the demand for more regional devolution will never command universal support. Added to which, I strongly suspect that those who argue for more local decision taking will also be at the forefront of those utterly outraged by the inevitable result of more “postcode lotteries” in the quality of public services in each locality. England is not so big a country that it needs to be split into bite-sized chunks, nor does it need a new Parliament. Those with a vested interest in protecting the sway of the Celtic fringe over the English just need to accept that it isn’t fair, and let it go. Meanwhile the Scotch [sic] referendum has been an object lesson to all of us who have hankered for a vote on Britain’s membership of the European Union. It so happens that most of the “scare stories” derided by Alex Salmond were true. Why would any company doing 90% of its business outside Scotland run the risk of keeping its base there when it could find itself in a different currency zone and subject to different rules, regulations and tax rates? Most of the scare stories about the risks of leaving the EU – particularly the “three million jobs at stake” – won’t be true, but I have little doubt that they will prove at least as effective. So if that promised referendum ever takes place, which I doubt, we will almost certainly be cajoled by the combined forces of the political establishment into voting to stay. The conspiracy theorists will say we were robbed. Next time, for once, they might even be right.